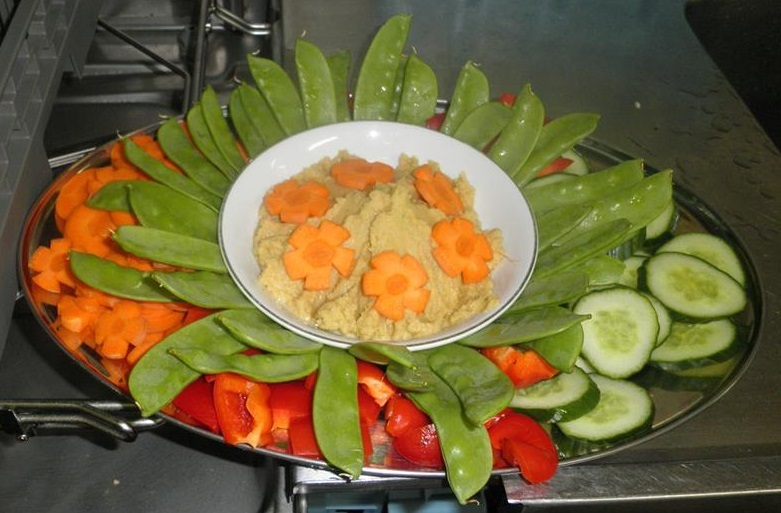 Rowena’s Fennel Hummous with Snow Peas and slices of carrot, cucumber and red capsicum. Sometimes I think the cosmos really wants us to eat chocolate and chips. And fast food. It seems to be everywhere, in bright packets, and just the smell can make us hungry. It’s far too easy to secumb to that temptation, even though we know “junk” food is not worth eating. Of course, it’s the food companies, not the cosmos, that try to tempt us into snacking; but their siren song can still be hard to resist, and can sabotage good intentions, (and waistlines!) Snacking, per se, is not a bad thing – it’s what we snack on that makes the difference. There are many healthy alternatives to junk food snacks when afternoon tea time rolls around, and these can fit nicely into a balanced diet. Fruit or vegies (like carrot sticks or cherry tomatoes) are of course always a good option. Yogurt or custard, made from fortified soy can be a tasty way to get extra calcium in; ideally, mix in fresh fruit to sweeten it, rather than buying a ready sweetened variety, especially as most fruit yogurts contain gelatin. Nuts are a great source of protein and good fats; enjoy them in moderation though, as they have a lot of calories! Drinks such as unsweetened tea or coffee, or better, herbal tea or vegetable juice, can take the place of snack foods when you’re watching telly or relaxing with a book. Smoothies are also a great option; if you make them at home, you can take them with you in any drink bottle you can wash effectively. If you are buying one, watch out for icecream in the ingredients – it adds calories without much in way of nutrients. Planning your snacks is key. By making sure you have something healthy, easy and yummy in the cupboard or in your bag, you make it much easier to resist the tempation of an unhealthy snack. Buy a mix of things depending on your needs, such as frozen berries, fresh fruit, nibbleable veggies, nuts, yogurt, cheese, and ready-to-eat tofu. Be a little wary of packages snack foods such as musli bars, as while they are an improvement of chocolate or chips, they are still high in sugar and fat. Desserts can be an issue, too. Many of us like our little something sweet after the meal, but ice cream is no health food. Choosing fruit-based desserts is healthier, especially if they have no added sugars or fats. There are several recipes in this newsletter for really healthy desserts – that you could eat every night if you wanted too! The Banana Ice Kream even counts as one serve of fruit per 3 scoops! For more healthy dessert ideas, google for “raw food desserts” and enjoy experimenting. If you are eating a more traditional dessert or junk food snack, the key is: don’t eat too much or too often. Have a small amount of your favourites every now and then, and really take the time to savour it and enjoy it! Importantly, don’t waste calories on mediocre junk food – if you don’t love it, don’t eat it. Eat a delicious healthy snack instead. Bon Appetit!